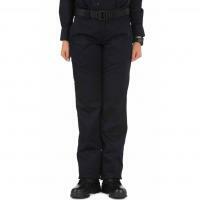 Patrol the streets, office or courtroom with confidence while wearing the Women's PDU Class-A Twill Pants from 5.11 Tactical. Designed for a woman's frame, the pants offer long lasting comfort that meets both tactical and regulation needs. The pants are made from a cotton/polyester blend and treated with a Teflon coating for wrinkle, stain and fade-resistant wear that is sure to turn heads. Permanent military creases along the front and back of each leg provide a clean professional appearance without ever having to go to the dry cleaner. A hidden pocket on the thigh offers covert item storage, perfect for personal documents or sensitive case information. A diamond gusseted crotch ensures full mobility through a day on duty patrol. The self-adjusting comfort waist delivers all-day comfort while the elastic gripper waistband holds on to the shirt, keeping it tucked in throughout physical activity. Love these pants They fit well, have hidden side-seam pockets, and they look freshly pressed all day long for a continuous professional look. Moreover, the fit is exceptional. I highly recommend this item.